My main goal is moonbounce but I am also qrv on tropo. This is my new 8m mesh dish. It is a 6m dish from OK1, stretched and assembled by my self and some friends and colleagues from qrl.. It is mainly constructed for lower microwave bands, but I have done also some qso's at 6cm with lower efficiency but really good results. Qrv since 2013. I am qrv with my dish on 144, 432 and 1296 MHz. Higher bands will follow in future. In moment I am not qrv an 6cm. Up to December 2011 I had a 6.5m dish in place. Unfortunatelly the dish support has been killed by to much heavy snow in the dish. The dish support has been renewed by a much stronger construction. The tower is an old electricity mast of Germain Train company. I have done the basement complete by my self. I took out the earth and add some 8 m^3 of steel and cement. This was mixed by my self and my oldtimer tractor was very usefull for transporting sand to my qth. It was straining but I was happy when finished. below 15..20 degree, because the moonset is behind neighbours house. 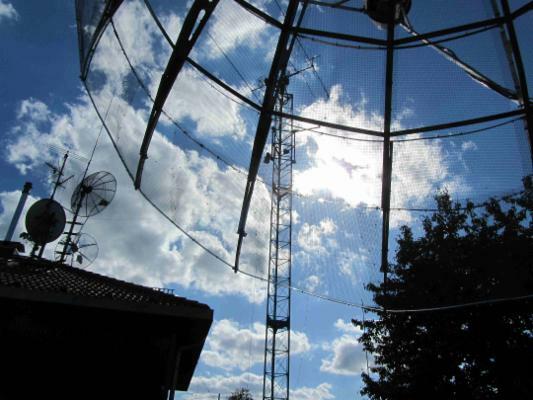 my old 3m mesh dish on an EGIS-rotator (modified). 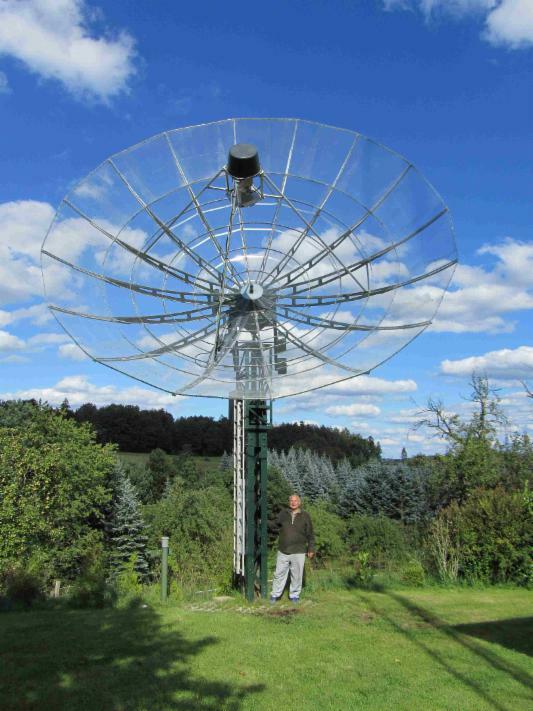 The dish is now used by Henrik SP6GPN.